Thanks to Dr. Hillary Kimbrell, Tulane University School of Medicine, Louisiana (USA) for contributing this case and the discussion. To contribute a Case of the Week, follow the guidelines on our Case of the Week page. The USCAP Long Course issue is comprised of lectures reviewing diagnostic criteria, application of ancillary tests including new molecular assays, and clinical significance of diagnosis and classification of common and uncommon lung diseases. Topics will include practical advice on interpreting both small biopsy samples and larger surgical specimens. This current issue is a comprehensive update of pulmonary pathology led by experts in the field, focusing on diagnostic challenges in the surgical pathology of both neoplastic and non-neoplastic lung diseases. Click here to access select articles from the USCAP Long Course issue for the next three weeks only. (1) We have added links for free CME from ARUP and Johns Hopkins to our new CME page, which has a link on the left side of the Home page. (3) Visit our new Drugs of interest to pathologists chapter, with information about drugs that affect our practice. 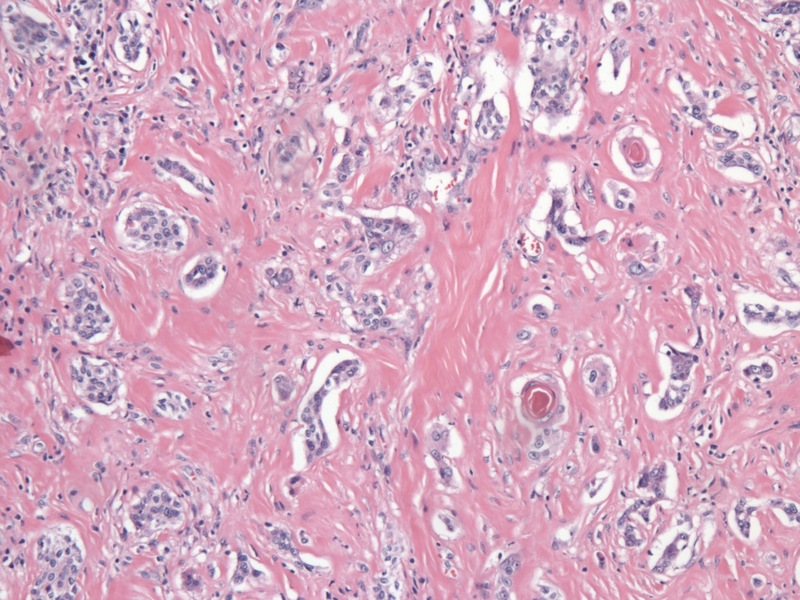 Middle-aged woman with locally recurrent thyroid tumor, which was biopsied. 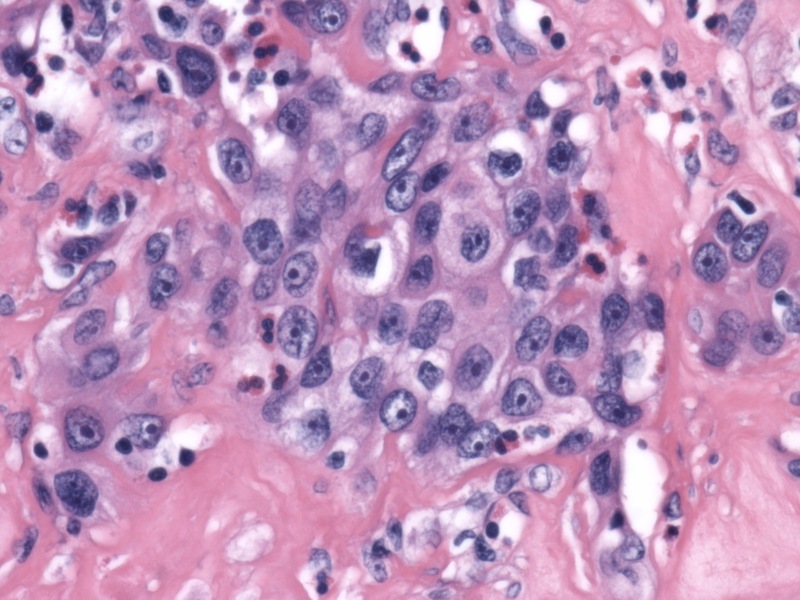 Sclerosing mucoepidermoid carcinoma with eosinophilia is a rare thyroid malignancy seen almost exclusively in adult women, with a female:male ratio of 17:1 (Mod Pathol 2000;13:802). 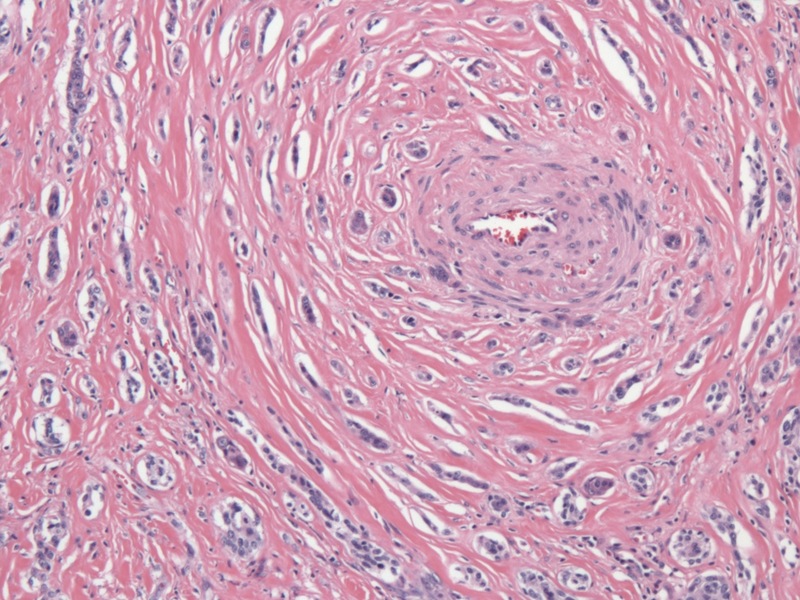 The tumor is composed of nests and anastomosing cords of relatively bland epidermoid cells with prominent nucleoli in a densely sclerotic stroma. Intermixed mucous cells can range from rare (as in this case) to abdundant, and some cases may have mucous cysts. Areas of squamous differentiation with keratin pearls can be seen. 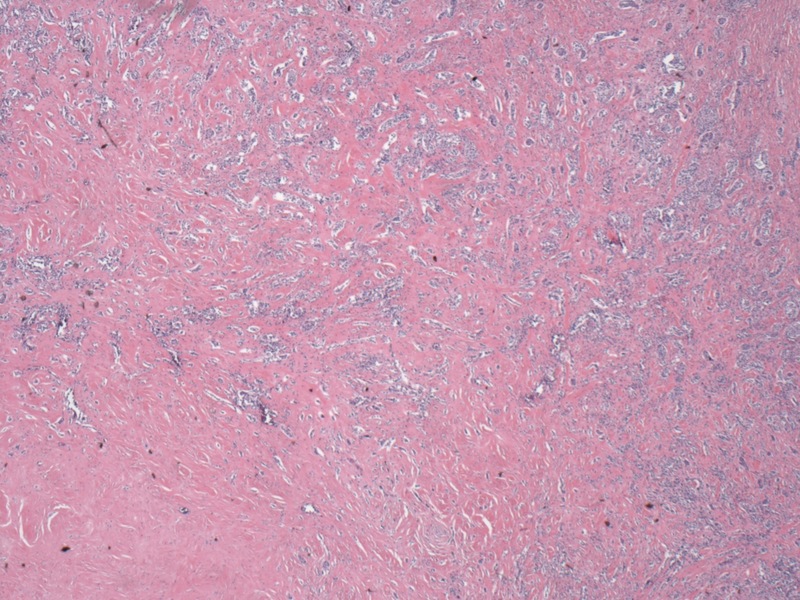 The stroma contains a mixed inflammatory infiltrate with numerous eosinophils. Perineural invasion and obliteration of blood vessels are typical features, and perithyroidal soft tissue is involved in about half of the cases. In patients with sclerosing mucoepidermoid carcinoma with eosinophilia, the background thyroid invariably shows chronic lymphocytic thyroiditis. 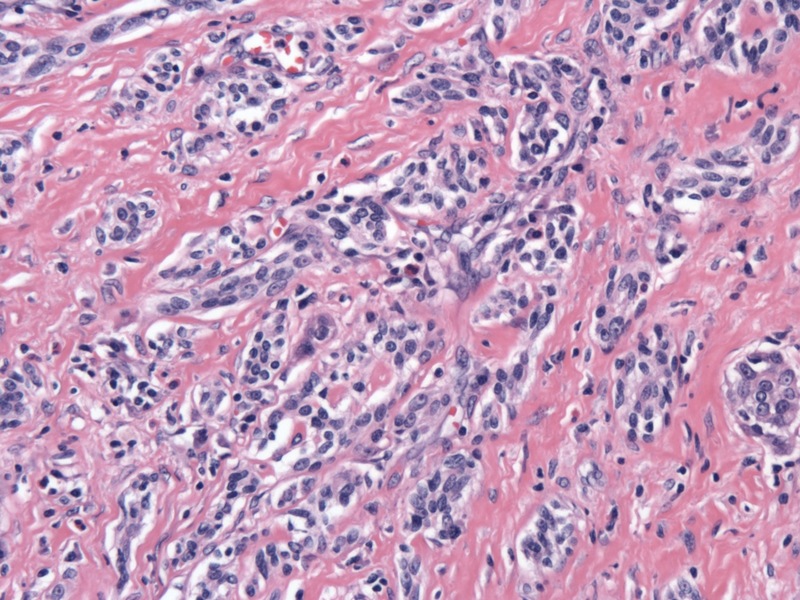 It has been speculated that this tumor arises from ultimobranchial body rests (also known as solid cell nests), which are often hyperplastic in severe chronic thyroiditis (Mod Pathol 2000;13:802). In keeping with this theory, the tumor cells in sclerosing mucoepidermoid carcinoma with eosinophilia are negative for both thyroglobulin and calcitonin, and TTF1 is negative in most cases (Mod Pathol 2004;17:526). 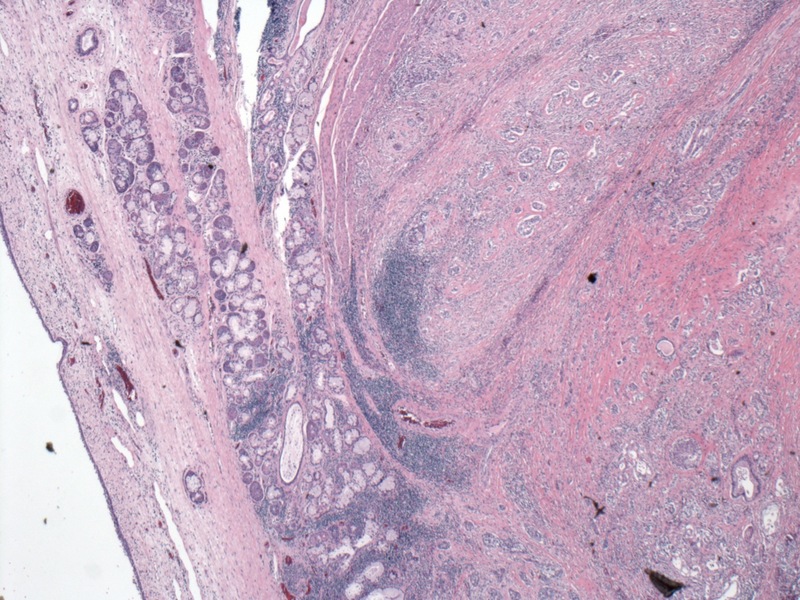 Further, sclerosing mucoepidermoid carcinoma with eosinophilia is diffusely positive for p63, which is also positive in ultimobranchial bodies, and negative in follicular cells. 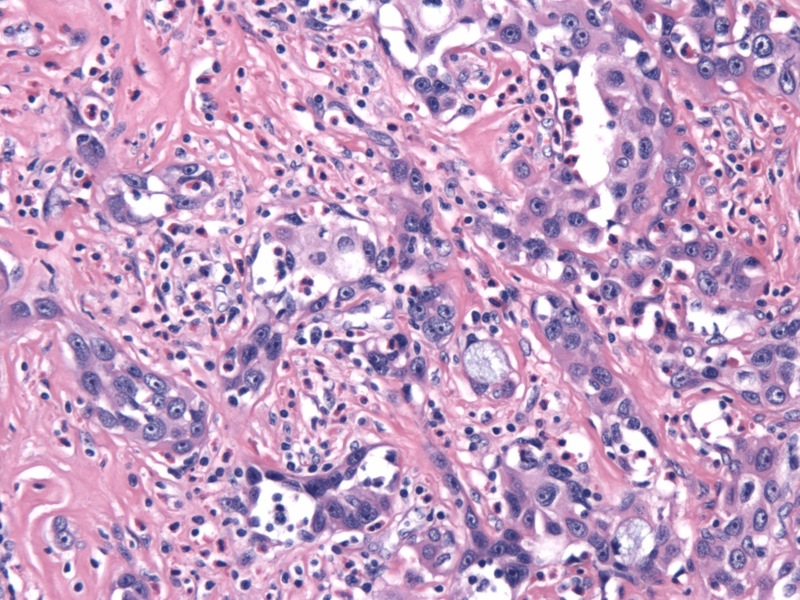 A BRAF V600E mutation has been identified in solid cell nests adjacent to a papillary thyroid carcinoma, which supports the idea that solid cell nests may give rise to thyroid malignancies (Hum Pathol 2009;40:1029). However, the WHO believes that sclerosing mucoepidermoid carcinoma arises from follicular epithelium-derived metaplastic squamous nests. Rarely, these tumors are associated with a conventional papillary thyroid carcinoma. This is generally an indolent malignancy; approximately one-third of cases have regional lymph node metastases, and rarely lung and bone metastases occur (DeLellis RA: Pathology and genetics of tumours of endocrine organs. IARC Press, 2004, page 320). This patient had several local recurrences over the course of a decade and eventually required a laryngectomy because of airway compromise.